Tell subway what you think on your next visit and you get a voucher for a free cookie. Less than 1min of questions (13 ish) and my voucher was emailed straight away. 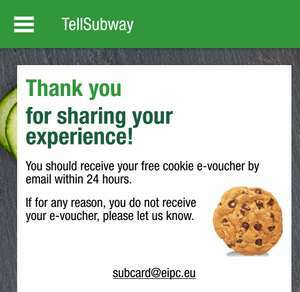 You show your emailed voucher and receipt and you get a free cookie! A lifetime of spam for a cookie? No thanks. Hit the unsubscribe/block button after you got your cookie?